IMPORTANT: the MPOD data logger extension is no longer available. We merged it to Easy LV|HV, our new control software. 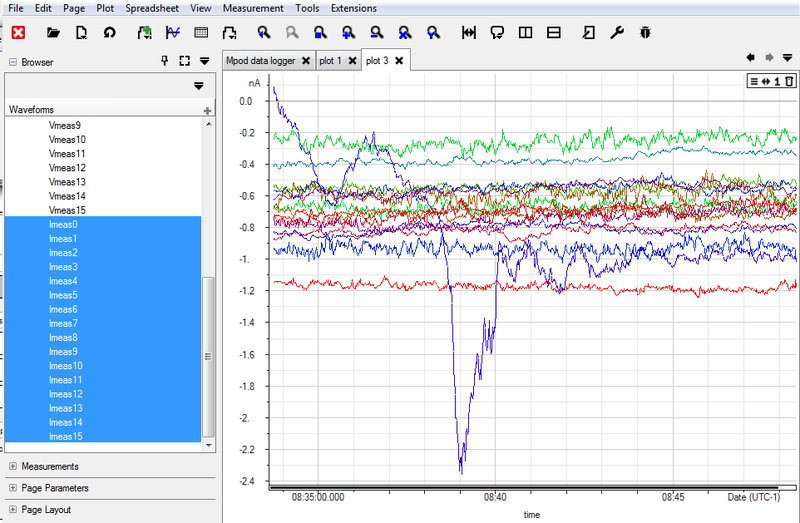 The MPOD Data Logger extension has been implemented for Physical Instruments and their customers. It extends BeSpice Wave. The extension allows to connect to a Wiener MPOD crate over an Ethernet connection. After having established a connection, the high- and low-voltage power supply modules are monitored. Curves are generated for the output currents and voltages measured by the power supply modules. The number of points for each curve is limited. To monitor a long-term behavior a CSV file with fixed time interval can be generated. This file can be imported by Microsoft Excel or Open Office Calculator or it can be visualized by BeSpice Wave. 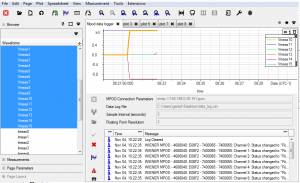 The usage of the MPOD Data Logger Extension is quite simple. Once you have started BeSpice Wave the extension can be activated by selecting the menu entry “Extensions -> MPOD Data Logger”. Establishing the connection to a Wiener MPOD crate. Now the connection to an MPOD crate has to be established by clicking on the “Find Connection To MPOD” icon. 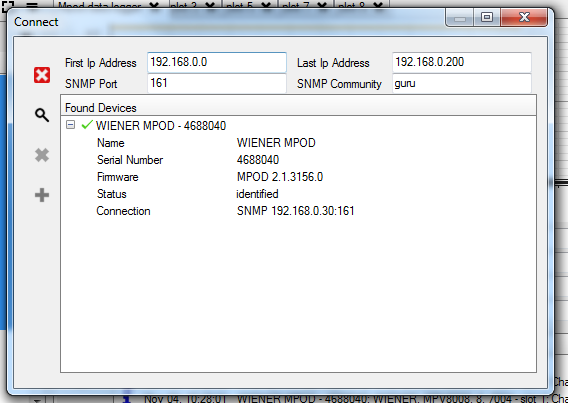 This shows a dialog box that allows to search for MPOD crates in a range of IP addresses. When a connected crate is found it appears in a list. It can be selected by double-clicking on the corresponding list entry. After having established the connection and if the crate is switched on, the software reads data from all power supply modules and stores the data in curves that are available from BeSpice Wave’s browser window. They can be shown in any plot window or in a spreadsheet. The MPOD data logger extension for BeSpice Wave. The software does not allow to control the crate. This has to be achieved by using software provided by the hardware suppliers. Logging to a CSV file can be started by clicking on the “Start Data Logger” button. It requires a valid file name in the “Data Log File” field. The precision in the CSV file and the time intervals can be controlled by modifying the values in the “Sample Interval” and “Floating Point Resolution” fields. 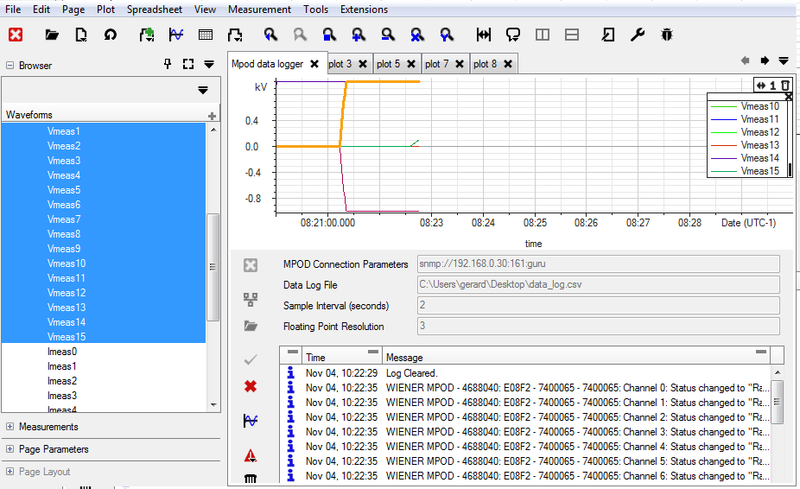 Messages concerning the data logger and the connected hardware are shown in the message log window. They can be filtered and cleared by clicking on the “Message Filter” and “Remove Messages” buttons. The MPOD Data Logger Extension uses the SNMP protocol and the Net-SNMP library to access the monitored MPOD over an Ethernet connection. 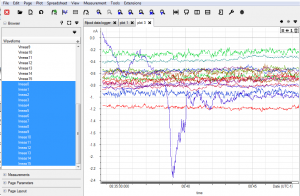 The MPOD Data Logger Extension is shipped with the evaluation version of BeSpice Wave. The license of the evaluation version is limited to 1 year. Please contact us for an unlimited license. Using BeSpice Wave and the MPOD data logger extension to measure a high voltage power supply’s output current.